In early 2013 I built a Tesla coil after receiving two neon sign transformers for my birthday. The Tesla coil was developed by Nikola Tesla to transmit large amounts of energy wirelessly, known today as a high-gain air core transformer. Tesla is said to have reached voltages over 100 million volts, the one pictured here reaches an estimated 1 million. Power starts flowing through a control box with two key switches, illuminated missile launch-style switch, and 20 amp circuit breaker. Inside is a relay system that supplies power to the outlet for lighting when the coil is turned off. Mains voltage then travels to the two neon sign transformers in parallel, supplying 12kV at 120mA. All wiring on the underside is 10 gauge jumper cable leads with screw terminals. Next, the tank capacitor is charged with high voltage. The capacitor is composed of 28 6.5kV 0.015uF polypropylene caps in strings of 4 in series and 7 strings in parallel, a total of 26kV @ 26.25nF. Bleed resistors and a PVC housing for safety. The spark gap operates as the trigger. 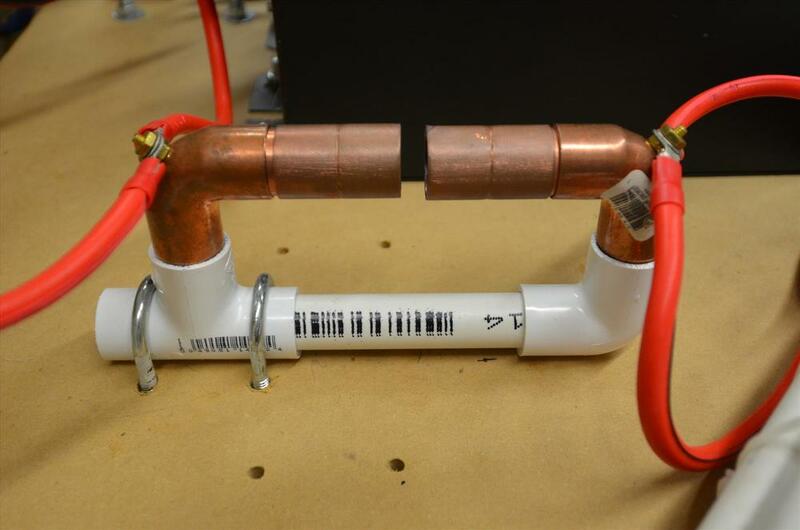 The two copper terminals are just far enough apart (about 7mm) for the tank capacitor to dump energy into the coils when the voltage reaches 12kV. Copper piping and vacuum cooling increase longevity of the spark gap. The spark gap directly connects to the primary coil, a flat 12-turn spiral of 1/4" copper tubing supported by HDPE and zip tied in place. A large fuse holder makes up tap points to tune the resonant frequency of the primary. A grounded strike rail prevents streamers from striking the primary and damaging the capacitors and transformers. Liquid electrical tape and Kaptop tape insulate the high voltage portions from shorting out. 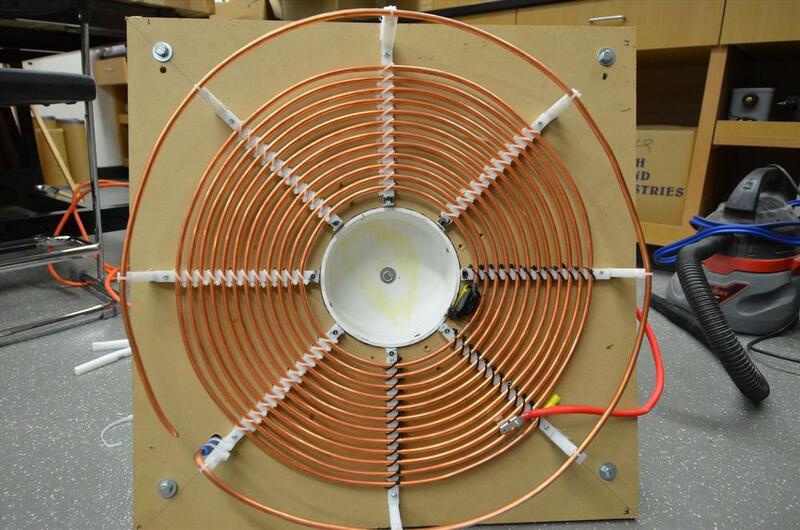 The secondary coil is made of 1800 feet of 23 gauge magnet wire, painstakingly hand-wound into 900 turns around 6 inch PVC pipe, a total 28 inches in length. 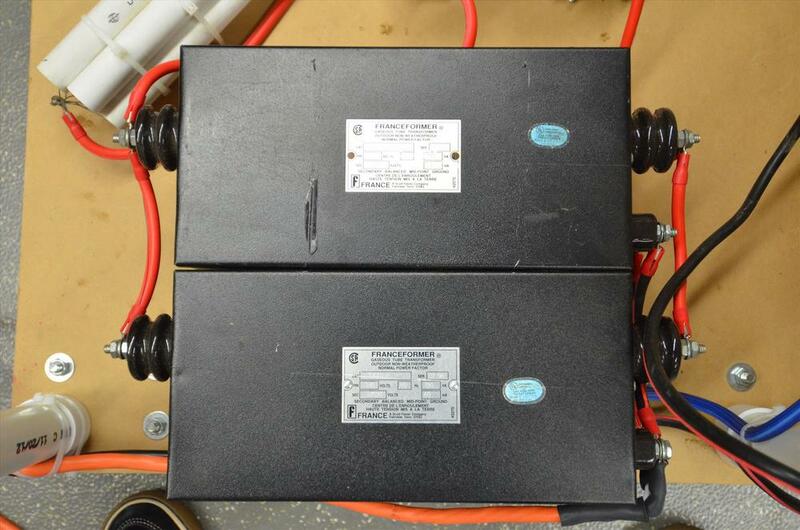 The top load serves as a capacitor terminal, charging and storing electrical potential relative to earth ground. The toroid is constructed of 6 inch dryer duct around 12 inch pie pans and layered with aluminum tape, a thumb tack serving as the breakout point. The coil is built on a base is made of MDF and on casters for easier transportation, with the top load and secondary removable as well. The longest spark length so far is about 60", neighbors don't really appreciate the noise!